As a product manager at the Department of Health and Social Care (DHSC), my job revolves around supporting colleagues to deliver better services and products. Sometimes this means pairing with a team for a longer period of time and sometimes it’s a quick meeting, an email or a workshop. 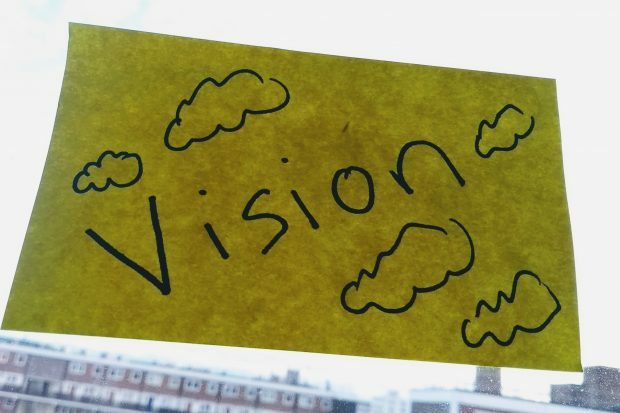 In this post I’m going to share a method I used to help a team write a vision for an internal product within the department. The team who requested our help already had an existing product. It was pretty good but wasn’t perfect. They knew a couple of features that needed to be delivered and had some user research to back it up. The one thing that seemed to be lacking was direction moving forward and what to work on next. So an hour-long workshop was set up to help the team clarify a direction. Why do a vision statement? Firstly, I walked through with the team the value in a good vision statement. Leading the nation’s health and social care to help people live more independent, healthier lives for longer. This post is also a nice summary of 10 principles for a better product vision, which you could share and go through with a team. Before the event I asked the team to share the evidence they had collected. I wanted them to be immersed in the research they had already done. I also wanted them to write something that would be steeped in real user needs. Underneath these headings I stuck up a sample of answers to these questions that I had plucked from the existing research. In addition to this I had found evidence and research from other teams outside of DHSC who were building something similar and had that in full view too. On the day, I asked the team to spend time looking at what I had and asked them to add anything missing. This started a great discussion and left us with a great list of needs we could base our vision on. This activity was very much inspired by the exotically named evidence safari exercise. After the caveats we got into the nitty-gritty. I wanted the group of 4 to co-create the vision from the very start. They had all the evidence in front of them and knew what people needed from the service. This was inspired by the 1-2-4 all technique. However, time began to run out so I ditched the first part. I spilt the 4 into pairs and they went off and wrote 2 first drafts. I then brought the 2 pairs back together and we all shared our draft visions and attempted to consolidate them into one. The team were brilliant and began highlighting the bits they liked without any direction from me. They cracked on and tried to construct one that represented all the best parts. It was really great to see. It’s not an easy thing to do but the team were really constructive with comments and worked through it. By the end of the session we had a first draft. While a good vision can be powerful, I knew in this case it wouldn’t magically solve everything for the team. So I invested a bit of time after the event to write up all the things we had created (such as the list of what users need and what the business wants) and some advice on what to do next now they have this vision in their arsenal. I think it was helpful in getting down issues on paper. Feedback, we probably needed slightly more time but not a whole lot more. It was a useful session. I loved the relaxed way that you ran it. My favourite bit was when we brought together our statements and used the different parts to reach the big statement – this is a very effective way of bringing the best of different perspectives together. I agree that it felt too short, even though we did overrun a bit. People do get worn out in long sessions though. So I would say probably 1.5–2 hours. Thanks so much for yesterday – I thought it was a great session and very well run.